Delhi High Court Today has reproached National Law University Delhi (NLU-D) for its faulty PhD admission Procedure. 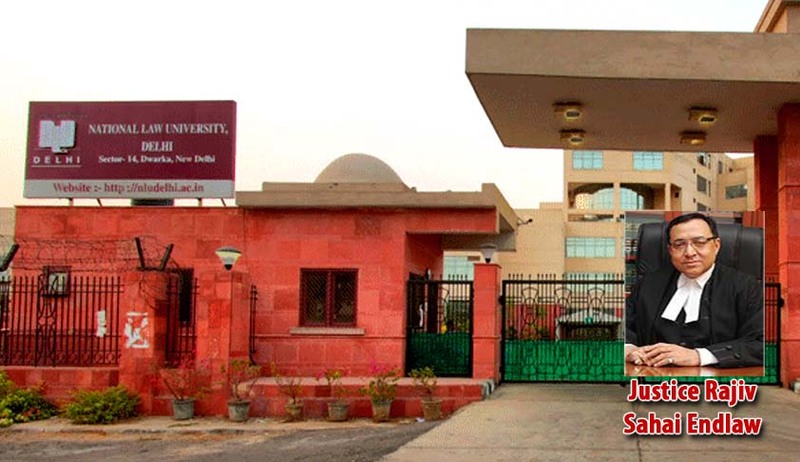 Justice Rajiv Sahai Endlaw said that all does not appear to be well with the admission process of National Law University, Delhi at least qua admission to Ph.D. programme. The Court was considering a Writ Petition filed by one PhD Aspirant Amita Agarwal challenging the list of provisionally selected candidates for admission to University’s Doctor of Philosophy (Ph.D.) Programme 2012-13. (i) that the petitioner was a candidate for admission to the Ph.D. course 2012 conducted by the respondent no.1 University (ii) that the admission was to be through a written test conducted by the respondent no.1 University, with the candidates who have qualified for University Grants Commission–National Eligibility Test (UGC-NET) / Junior Research Fellowship (JRF) / State Level Eligibility Test (SLET) / Master of Philosophy (M. Phil.) being exempt from taking the admission test and on the basis of a presentation by the qualifying candidates before the Doctoral Committee on the proposed topic of research; (iii) that the petitioner submitted her Ph.D. thesis within the prescribed time till 12th May, 2012 but the last date for submitting the thesis was extended to 13th August, 2012; (iv) that the petitioner was by e-mail dated 9th August, 2012 of the respondent no.1 University informed of her selection in the written test and was asked to appear before the Doctoral Committee on 8th September, 2012; (v) that the Doctoral Committee asked the petitioner to submit the revised synopsis with some minor amendments and which was also submitted by the petitioner; (vi) that in the list of 13 candidates selected declared by the respondent no.1 University on its website on 1st October, 2012, the name of the petitioner did not find mention and on making enquiries the petitioner was told on 3rd October, 2012 that the Doctoral Committee had already selected 11 candidates during interviews held on 8th and 9th September, 2012 and subsequently two more candidates had been selected; (vii) that the respondent no.1 University on 12th October, 2012 uploaded a new version of the list of selected candidates with addition of Ms. Deepika Prakash; (viii) that it is quite evident that Ms. Deepika Prakash‟s name was not among the seven candidates required to submit their revised Ph.D. synopsis by the Doctoral Committee; (ix) that on making further enquiries, the petitioner was told that owing to a inadvertent mistake, the name of Ms. Deepika Prakash was left out in the list of selected candidates declared on 1st October, 2012; (x) that two of the selected candidates viz. Sh. Ram Kumar and Ms. Nivedita Ghosh had secured 44 and 43 marks respectively in the written exam and which were far below the requisite minimum 50% marks needed to qualify for interview; (xi) that Ms. Dikshan Munjal and Mr. J.S. Dahiya whose names were also included in the list of selected candidates were faculty members of the respondent no.1 University and their admission is also in violation of Ph.D. regulations; (xii) that since the Doctoral Committee had not awarded marks for synopsis and viva voce, ranking of the candidates for taking decision for admission could not be done in an objective, prudent and transparent manner. The counsel for the petitioner argued i) that though as per the prospectus the number of seats for Ph.D. were to depend on availability of suitable candidates but not to exceed 10 students in an academic year but 14 candidates were admitted; ii) that no objections were raised to the revised synopsis submitted by the petitioner; iii) that the respondent no.1 University in reply to the letter of the petitioner had disclosed that Ms. Deepika Prakash was selected by the Doctoral Committee on 22nd September, 2012 but there was no meeting of the Doctoral Committee on that date; iv) that the Doctoral Committee constituted a Sub-Committee to go through the revised synopsis and which was also not permissible under the rules of admission approved by the Academic Council; v) that the marks obtained by each candidates before the Doctoral Committee were not disclosed; vi) that the respondent no.1 University has not disclosed the Ph.D. Regulations applicable at the relevant time and the Regulations relied upon in response to the letter of the petitioner are of 18th September, 2012 i.e. of subsequent time; and, vii) that the entire admission process was biased and prejudiced. The senior counsel for NLU Delhi contended that a) the petitioner in the petition has not raised any ground of the respondent no.1 University having admitted candidates in excess of the number prescribed to be admitted; b) that only 12 candidates have been ultimately admitted; c) that the cut off percentage for the entrance test was not 50% but 40% for general category students and 30% per Scheduled Caste and Scheduled Tribe category students – attention in this regard was invited to the document dated 30th August, 2011; d) that no case of bias or prejudice to the petitioner has been established least made out. Counsel for NLU Delhi in response to the query as to how, when the prospectus clearly provided that not more than 10 students shall be admitted in the Ph.D. programme in an academic year, could more be admitted, merely stated that the nature of the programme is such where if more candidates are found eligible, can be accommodated. However the Court found it difficult to accept. The Court said that if that were to be so, the University ought not to have in the prospectus provided that in no case more than 10 candidates will be admitted in an academic year. I am therefore compelled to observe that all does not appear to be well with the admission process of the respondent No.1 National Law University, Delhi at least qua admission to Ph.D. programme, unless it has been rectified since then; I was however not told so. I take this opportunity to remind the respondent No.1 University that its reputation is as good as products it produces and any dilution in competition at the stage of admission can be an obstacle in the path to achieving academic greatness, The Court added. “before commencing the admissions to the Ph.D. programme in the year 2016 revisit the admission criteria in terms of the observations herein above and to clearly advertise the same so that the possibility of officials of the respondent No.1 University manning the admission process granting admission to whomsoever they desire can be ruled out and admissions are strictly as per declared criteria”.